I don’t frequent Saratoga as often as I’d like but when I do think about it I think of class. The shops and restaurants on Broadway which is more upscale than and has a completely different feel than downtown Albany. 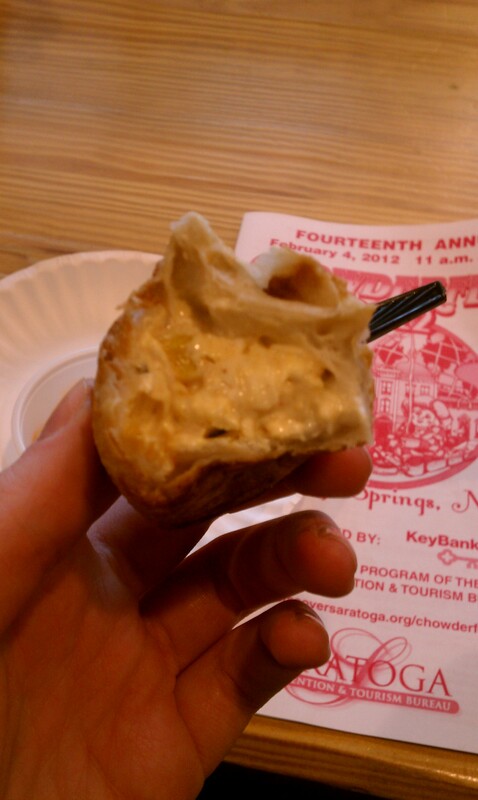 I recently went for their yearly Chowderfest and though since I was working, I wasn’t able to partake in any chowder but I was able to grab lunch quick from Esperanto (Caroline Street, Saratoga). I’m familiar with Esperanto from various let’s call them frequent social late Saturday night gatherings on Caroline Street. After I’d be out with my friends, I’d crave a warm slice of pizza and Esperanto was there until 3:30AM (every Friday & Saturday night) to appease my hunger. What I didn’t realize was that they’re quite famous for their DOUGH-BOYS. A dough-boy is sauteed chicken breast diced & spiced, blended with cheeses and scallions and baked in fresh pizza dough until golden brown ($3.50). I decided on the dough-girl which is the vegetarian version that includes all of the same things except instead of chicken had roasted red peppers, corn and some other vegetables. It may seem as if it wouldn’t be filling but it truly was. I normally don’t like to eat these types of fried food but I was assured by my coworkers that it was something that couldn’t be missed and that’s the truth! The consistency is difficult to explain, it’s definitely cheesey but there was no overpowered cheese flavor- left me mindboggled. My favorite part was that I tasted each and every vegetable and found pieces of actual corn and pepper and showed me how fresh these actually are. I’m one of those kinds of people who if I order a veggie burger, I want to see veggies in it; same goes here and I was impressed. The sauce that goes rather well with the dough-boy/girl is Frank’s Red Hot. I tasted it without the sauce and it’s not necessary but it definitely compliments the flavor. Even after all my coaxing, this doesn’t seem to be your cup of tea, they have food from Greece, Mexico, Thailand & Middle East so there’s gotta be something there you’re in the mood for. 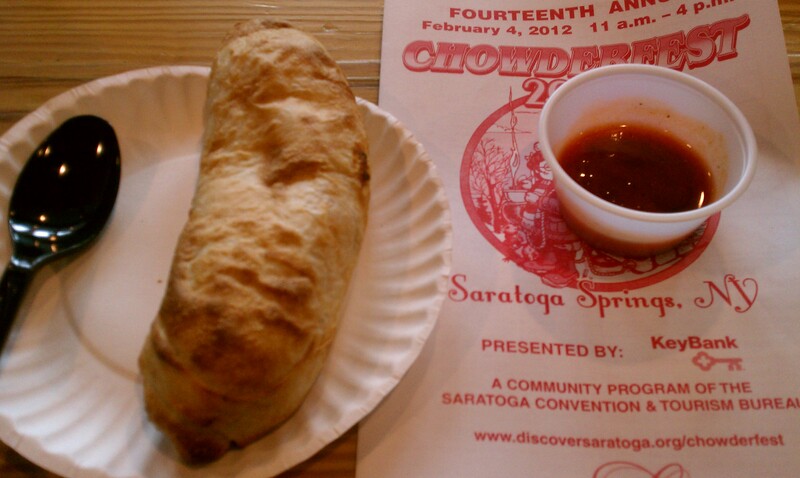 Next time you’re in Saratoga and especially if you’re on Caroline Street on a late Friday or Saturday night, stumble into Esperanto and give the FAMOUS dough-boy (or dough-girl) a try! I’m sure you’ll enjoy it as much as I did! Has anyone else experienced the dough-boy? What did you think?